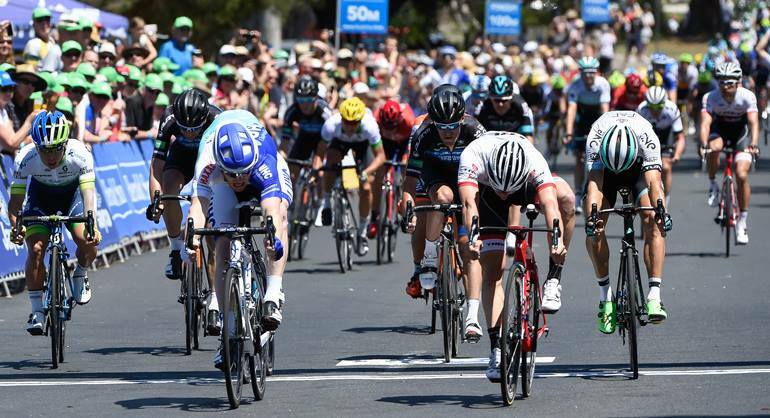 It was third time lucky at the Jayco Herald Sun Tour for American sprinter John Murphy (UnitedHealthcare) as he celebrated an upset stage victory in the seaside town of Inverloch on Saturday. Murphy, now 31, began his pro career in Australia at the event in 2006, then returned to the race last year but scored his first Australian victory today. A photo finish deemed Murphy the winner of Stage 3 over Niccolo Bonifazio (Trek – Segafredo), with Australian Steele Von Hoff (ONE Pro Cycling) rounding out the podium. Caleb Ewan (ORICA-GreenEDGE), having dominated the summer of cycling, finished sixth man across the finish line. 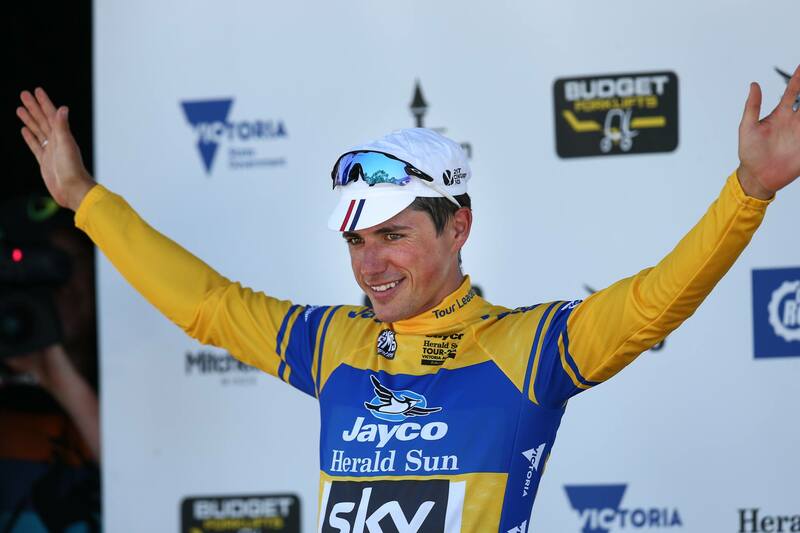 As the sprinters came to the fore on the 146.2km stage between Traralgon and Inverloch, there was no change to the General Classification with in-form Peter Kennaugh (Team Sky) able to relax somewhat ahead of Sunday’s decisive stage on Arthurs Seat. In what promises to be an epic finale, the British champion maintains his 13-second lead over teammate, reigning Tour de France winner Chris Froome, with a further 18 seconds back to Australian champion Jack Bobridge (Trek – Segafredo). ORICA-GreenEDGE will need to produce some heroics if they are going to elevate Jack Haig to the podium. Murphy positioned himself to perfection, with a short descent and a narrow 90-degree left-hand bend in the final kilometre of the stage into Inverloch. “I don’t really think any sprinter’s unbeatable,” Murphy said following his win. “UnitedHealthcare Pro Cycling was unbelievable today. They took me in to that last corner in perfect position and all I had to do was just my sprint. Kennaugh, having won the Cadel Evans Great Ocean Road Race last weekend, has held the yellow leader’s jersey since day two in Healesville. He said it would “mean absolutely everything” to be able to hold on to the overall lead, but still left the door open for his teammate Froome to add Arthurs Seat to his enviable palmares. The Kenyan-born Brit who finished as runner-up on the Mt Buller stage back in 2008, admitted a win on Arthurs Seat would be something very special for Kennaugh and Team Sky would be on the offensive all day. Kennaugh however was happy to keep a low profile today saving as much energy as possible for what is sure to be one of the best days of racing seen on the Australian cycling calendar. Kennaugh, having experienced plenty of full-throttle racing earlier in this 63rd edition of the Sun Tour, is wary that there will be plenty of riders looking to spoil a Team Sky one-two. “It’s a different climb to the first day it’s obviously a lot shorter and we saw yesterday on the shorter climbs that guys like Jack Bobridge and a few others can hold their own,” he said. “I think it’s going to be a different kind of a race and a different style of race and we’re just going to take things one step at a time throughout the stage, see how the legs are. 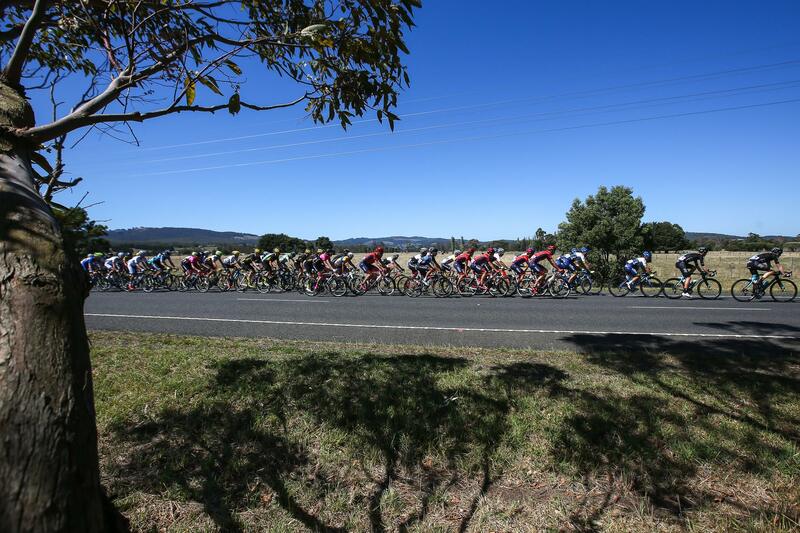 A sprint finish in Inverloch was a 99 per cent certainty and so, the peloton let the day’s break go with ease in the opening two kilometres of the stage, on the outskirts of Traralgon. Ben Hill (Attaque Team Gusto), Dan Bonello (St George Merida), Morgan Smith (Kenyan Riders Downunder), Russell Downing (JLT Condor) and Thomas Hubbard (Data#3 Cisco Racing Team p/b Scody) quickly gained time on the peloton, riding out to a maximum gap of 4:26. While little could be gained from the two Cat.3 King of the Mountains primes in terms of the battle for the Budget Forklifts polka dot jersey, Hill was determined to regain the lead in the Chain Reaction Cycles green sprint jersey which he lost on Friday to Kennaugh. “Yesterday was a bit disappointing,” Hill admitted. “I tried to get in the move yesterday and just didn’t get in it – then I was tired and missed the split over the hill. It was a bit easier to slip in today. Hill now holds a six-point lead over Kennaugh in the sprint classification. The peloton left the quintet dangling until around 25km remained in the stage, with the ORICA-GreenEDGE and Team Sky-led chase knocking minutes from their lead. Hill and Hubbard were the first two riders to concede, working their way back to the bunch while Smith valiantly attacked before the remnants of the break were reeled in with 10km left to race. The final bend leading to the final 500 meters loomed as a potential spoiler to the sprinters, but the peloton navigated the left-hand-turn without issue. Murphy realized he still had work to do. “Coming out of the corner, I thought the corner was a little bit further from the line so when I came out of the corner, I realised I had to start,” he explained. “Boom! Just go from there and hope I can hold it to the line. It was a really close finish with Bonifazio so I’m definitely pretty happy to just have that photo. The yellow jersey won’t be the only prize up for grabs tomorrow on Arthurs Seat, with just one second separating the first two riders battling for the State Government Victoria White Under 23 Jersey. The Budget Forklifts King of the Mountain Classification and Chain Reaction Cycles Green Sprinters Classification will also go down to the wire.